"My stockpile of heatball prototypes, which I used to call “light bulbs”, is running out." Sometimes people are so clever I wish there was some kind of award to recognize their greatness. Its the little things I'm thinking about, not Nobel Prize territory but something small and ingenious, especially ideas to thwart the tyranny of the nanny state left. For example, in Europe, the unelected body of EU government decided that any light bulb of over a certain wattage was now illegal in the entirety of Europe. 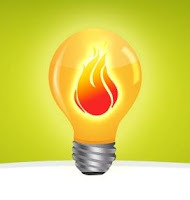 They figured that it wasn't enough to force people to avoid incandescent bulbs, now they had to ban any light of more than 60 watts, to save us all from the myth of human-caused climate disaster. Basically they've found a way within EU regulations to sell you real light bulbs which people greatly prefer as cheaper and better light over the compact fluorescents, and they're making a killing. What we need is a conservative Nobel to give prizes to people who come up with innovative and effective ways to defy tyranny and display capitalistic genius. A reward for being brilliant and making a statement against those who would take away our liberty "for our own good." I'm a bit short on cash, but maybe someone else could step up. *Tip of the ol' bush hat to Tim Blair for this story. I think the "conservative Nobel prize" already exists; it is known as a "profit!"